It has been a week that has cruelly put life into perspective. Suddenly it didn't matter what loan registrations were, when the latest repaint was being completed, or what loco was on what train. It just didn't matter and I couldn't have cared less. I postponed plans for hoped meetings and remembered what I do is a hobby and no more. Sometimes it's all too easy to forget that, and treat it like life and death. It's not. My heart goes out to those affected by the Manchester murders this week. To call it terrorism gives credence to the imagined justification for it. It wasn't terrorism it was murder. May the victims rest in peace, and their families find peace and strength in the love and support the entire nation has, and will continue to express. Another rural route is about to be axed. The little known Paul Frost Travel 62 from Woodbridge to Framlingham is going from the end of June. There are rumours it may still operate a couple of days a week but there is no confirmation as yet. It's not for bad service - Nigel the regular driver couldn't be a nicer bloke, and to have a bus service playing ClassicFM is a welcome change from personal iPods blaring Lord knows what out. You can literally time your watch by the service. It has a loyal band of passengers which has clearly not proved enough. So what has been the route's downfall? Quite simply the route itself. It was not designed for major use so no surprise it hasn't been majorly used. Where exactly was it linking Framlingham to and why? 3 hours in Woodbridge isn't easy to fill. It won't ever attract custom from Wickham Market with only 3 journeys a day. So it has served its extremely limited market to the best of its ability. 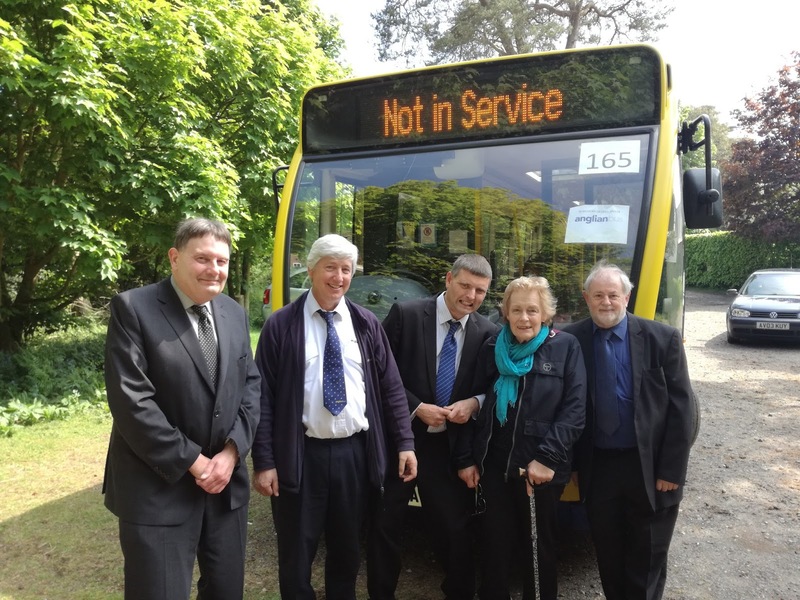 I have advocated for years now a bus service linking Wickham Market and Framingham to Campsea Ashe Station. If you live in Framlingham, which is expanding at quite a rate there is not a bus to any station anywhere except the Wednesday 62 to Saxmundham, which only gives you a couple of hours anyway so pointless for the station. And is being axed. Why not? If you live in Wickham Market there is no bus to your nearest station, you have to go to Melton ( a walk from bus) or Woodbridge then double back if you're heading towards Lowestoft unless you go to Saxmundham but of course the buses don't connect with the trains and the timetable I discussed with First to alter that was never implemented. It's hardly going to encourage passenger growth is it. It's not even confined to the sticks either - there are no buses to Great Yarmouth station either can you believe. Want to catch a train if you live in Gorleston? Well you can go to Yarmouth Police Station and walk, or go to Lowestoft, and walk again unless your house is on Anglian's 61 that week! Surely that's not right. I thought the entire concept of "public transport" was the conveyance of passengers easily and conveniently from A - B in return for a fare. That concept seems to have gone out of the window when you see company Tweets like this one I saw today from an operator whose identity I shall keep secret. "Great to catch up with X & Y to discuss further alignment of local transport to economic development"
What??????? How is that going to help Mrs Smith do the shopping or get to the station, or the kids to get back from the cinema without relying on their parents. 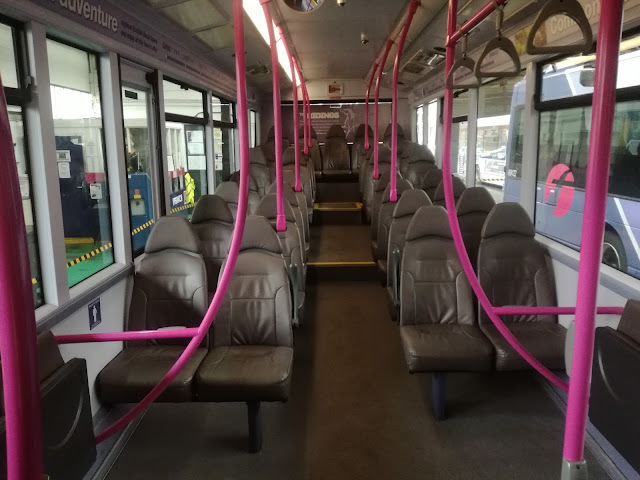 The basics of public transport have been entirely forgotten, and if the future for bus services outside major towns and cities has any future then basics have to be resurrected with some tinkering, and that got me thinking. As part of future rail franchises make compulsory bus links to stations from a 10 mile radius a condition, to connect with first and last trains. Give people a reason to use public transport, rather than reasons not to. Obviously those buses would be tendered out by the Train Operating Company, but let's face it - who are the major TOC's in the country? Oh yes First, Stagecoach, Arriva and Go Ahead. So instead of Councils tenderng the bus services it woud be the TOC as part of their franchise. Then my elderly friend in Wickham Market can keep her alarm in her sheltered flat, which is being taken away as the Council are no longer funding it. (Yes Smurf I know!) There has been a precedent to this - London Transport. I asked a very knowledgeable contact of mine who has worked in the transport industry in London all his life if he could think of a single station served by either tube or train that didn't also have a bus serving the station. He couldn't. Not one. He said there must be but he couldn't think of any. That's because London Transport were an interested party in both modes, and realised that both had to link together if they were to be really attractive. Combined tickets were available and the rest is history. Now obviously I'm not suggesting that Framlingham gets a London Transport type service to Campsea Ashe station. But what's the point in getting the train into town for a night out if you have to drive to and from the station. Defeats the object of the exercise. I bet anything that if TOC's were responsible for local bus services they would make darn sure everything linked up together - timetables, ticketing, frequencies etc to get those bums on seats. Places like Beccles, Thorpe-le-Soken, and Sheringham would have buses connecting with last trains, and authorities with real teeth, unlike the Traffic Commissioners who only seem to hit the small guys, and the Rail Regulator - who as far as I've seen has done diddly squat over the various industrial disputes, could fine and withdraw franchises if necessary. That is the basic idea. It couldn't be achieved overnight, but then nor was putting Neil Armstrong on the moon. It would take time to take off and get the public enthusiastic so initial losses must be expected. It would require investment, but that would pay for itself with the extra revenue generated. Never mind "further alignment of local transport to economic development", put buses where new houses are built, remember who public transport is for, who uses public transport, and the basic reason public transport was created in the first place. Thursday was a poignant day. It was the funeral of Lena Sadler, bus campaigner and friend. She was also a member of the 165 club, a group of passengers and drivers who remained in touch after Anglian's 165 Aldeburgh - Ipswich route was axed in 2013. 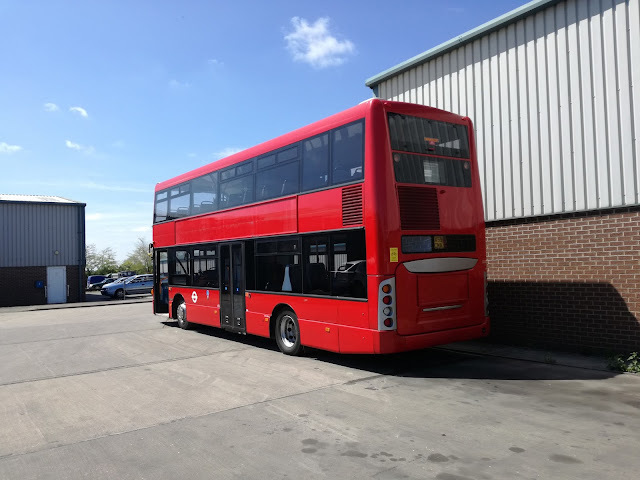 I thought it would be a nice idea if Anglian could supply a bus as a tribute to Lena so I approached Mickey Amey, Depot Manager at Anglian who couldn't have been more accommodating, saying that yes, as long as a spare vehicle was available he would be happy to help out. The church was packed, and a short, simple but moving service took place, with Lena being laid to rest in the churchyard after. There were no frills about Lena, and I know she would have appreciated the simplicity of the occasion, and would have laughed herself silly at the sight of the bus blocking the car park. Peter also took some pics, a couple of which I'm delighted to be able publish here. It was fantastic to see so many people there, including some who knew Lena just from chatting on the bus. Lena was that type of person. She left her mark on whoever she met and I predict many glasses will be raised in her memory for years to come. My heartfelt thanks and gratitude go to Mickey and Dave Smith at Anglian. I'm not sure regimes of the past would have been as willing to accommodate, and it is another indication of the positivity that has started to flow through Anglian's veins. The gesture was truly appreciated by all and certainly turned a few heads. Thanks to Paul for doing the driving, and it turned a sad occasion into a nice one too. Quite simply 24 hours ago I had no idea of anything contained in this post, so it's all happened a bit suddenly. First of all I was contacted last night by a BorderBus driver who rather vaguely said there was a red double decker parked up in the yard, and it could be ex London. So as I had to go to Ellough anyway today for other reasons I popped in fully expecting to see a Gemini when a rather striking Scania Omni Citi decker came into view. I have been on several of these in London and they are great buses, at least they would be if it wasn't for one tiny problem - the seats are what Satan would design if you had to spend the rest of eternity on a bus being punished. I have spent 90 minutes on one and it felt like 90 days. So it's fair to say I had mixed feelings when I saw ex Stagecoach London 15137 LX59 CNA gleaming in the Suffolk sun. COULD be ex London? Seriously!! The Scania at BorderBus depot. The Scania is on loan to BorderBus for fuel economy evaluation. It will be used on the 146 over the next few days, and if the fuel data is satisfactory it is likely that a number of the Scanias will be purchased. They would be converted to single door, probably have more seats added upstairs as the amount of legroom is way beyond coach standard. I'm not normally in favour of reducing legroom but with these it makes sense. And yes, the seats will be either replaced or upgraded to include foam to boost comfort. I'm not joking - those Scanias give seriously good rides, and with decent seats will really give the Geminis a run for their money. I hope the evaluation goes well, and I'll report back when the decisions have been made. My thanks to Andrew and Dave for the info and I'll watch this space with interest. In the meantime check BorderBus's Twitter account for info on what the Scania will be doing. One thing we couldn't do, however, was imagine the Scania in BorderBus Livery. Enter Sam Larke and his computer and voila! Thanks Sam, might not look too bad! 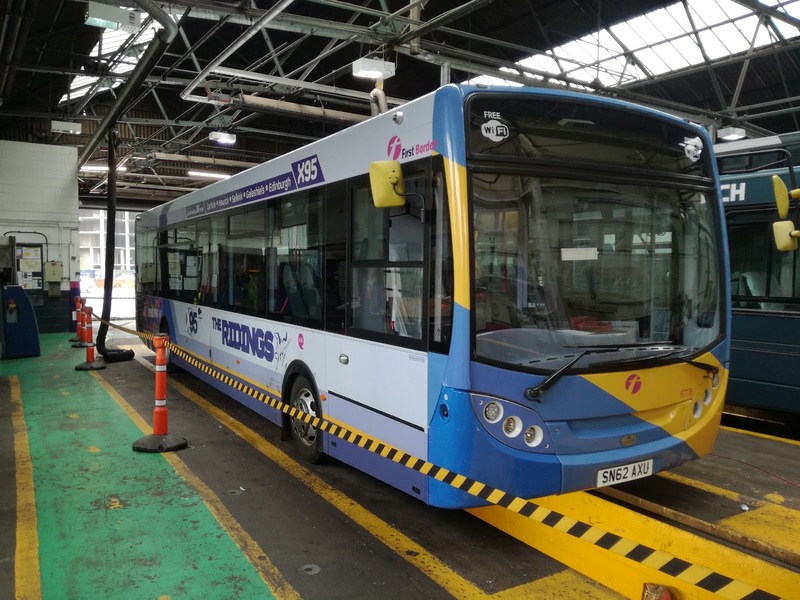 A quick postscript now - the E300's for Ipswich P&R have coe fro the ex First Borders operation in Scotland, which is now run by a new company called Borders Bus. You probably know where this is going - Andrew Pursey has had to field multiple daily complaints about buses in Galashiels. I just wonder how many complaints are being received in Scotland - or compliments even - about buses in Wangford! Next something nice, really nice. It has been sometime since I had anything positive to say about Anglian Bus. The last 3 years has seen a slow painful demise for all concerned. Blame lies entirely with Go Ahead who failed spectacularly to understand how a rural operation functioned, and also failed equally spectacularly to learn from their mistakes. If it wasn't for the drivers and staff at Anglian the company would have been history months if not years ago. However, today it was my pleasure to meet Mickey Amey, the new Operations Manager at Anglian. I admit I wasn't sure what reception I'd receive, but the welcome couldn't have been warmer. I was there primarily on non blog related business, but obviously the subject turned to the current state of affairs at Anglian. For the first time ever I had the feeling I was talking to someone who wanted to turn the company around, put new flesh on the bare bones, and had the enthusiasm and man management skills to achieve it. Just a quick word to the Go Ahead supremos - GIVE HIM THE TIME TO ACHIEVE!!!! With backing and investment the phoenix could yet rise from the ashes with a man at the helm who understands how a rural depot works. That was how Anglian became successful in the first place under the Purseys and if Go Ahead let Mickey Amey get on with things it can again. Most of what I discussed with Mickey cannot be published yet, but one thing I can do is reveal why Konect have registered Beccles as an operating centre. 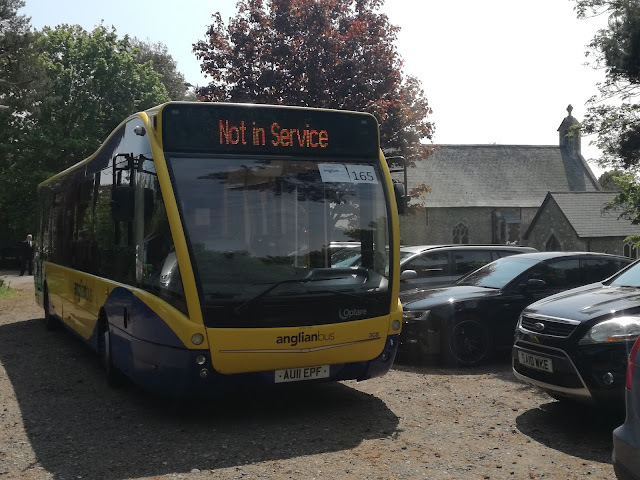 Anglian will also be registered at Rackheath and it's purely so in exceptional circumstances such as breakdown either operator can use each other's vehicles. 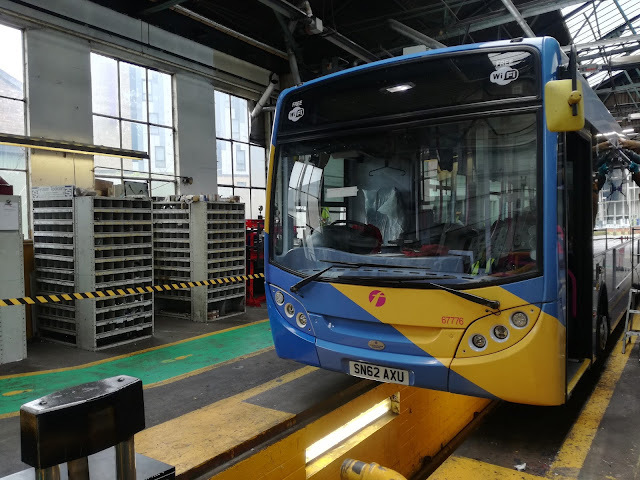 This will help at Norwich for example and will save time getting spare buses out from depots resulting in less loss mileage and fewer cancellations. It was a real pleasure chatting to Mickey Amey, and I will only be too pleased to report anything positive coming out of Anglian. Let's hope the bad times are over and the rebuilding can begin. I thought that was it but no. 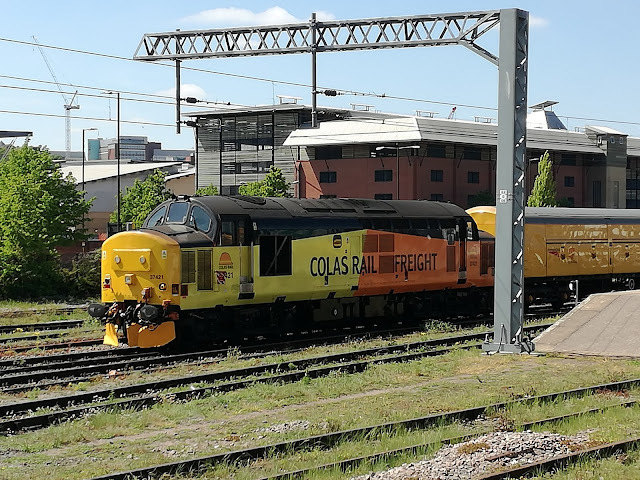 As I was having lunch Tim rang me to tell me the Class 37 short set, which had been off the track, was coming back with an added DBSO, for storage and braking purposes. So back to Norwich Station I went and sure enough there was the set with DBSO 9705 backing onto 37403. 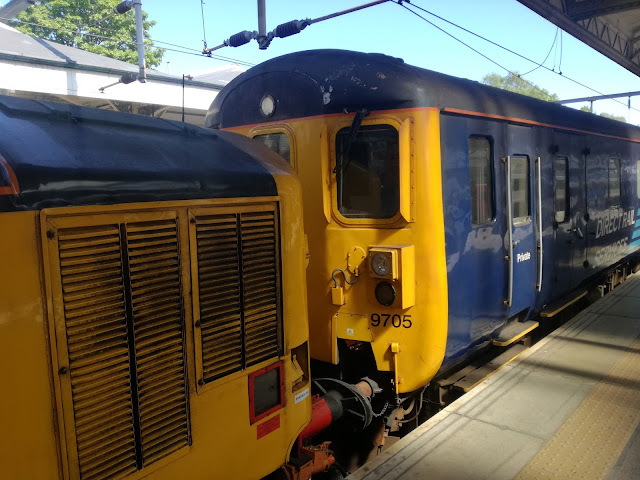 I took a video of the train leaving Norwich - with only 37423 active, and just as well as the set promptly failed at Lowestoft and was taken out of service! So there we are, a full day, none of it expected, and all of it enjoyable and rewarding. If only all days could be like this! 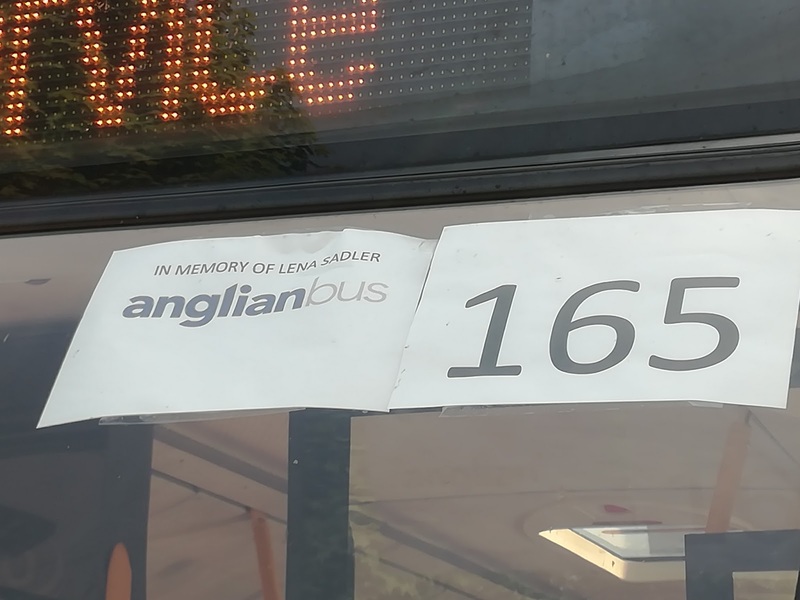 When I first started the blog I was contacted by Lena Sadler, a Leiston resident and founder member of the 165 Club, a group of former passengers and drivers who were regulars on Anglian's Aldeburgh - Ipswich 165 route. Lena was truly passionate about bus services in the area, tirelessly campaigning for the return of the 165, and encouraging me all the way with regard to rural bus services. Lena, always bright and bubbly was riddled with illness, which she never complained about although it could wipe her out for days at a time. Very sadly her illness finally beat her yesterday, when Lena passed away at the ridiculously early age of 49. Lena was one of those people who lit up the room with her very presence. I was lucky enough to have lunch with the 165 Club last Summer and Lena was the life and soul, even though she had to depart early for medical reasons. One of the joys of travelling on the 64 was knowing there was a chance Lena would be on board, and indeed the first time I met her was on a 64 when she was talking about my blog with another passenger - a really surreal moment I'll never forget. Some people it's nice to know, some people it's wonderful to know. Knowing Lena was a joy, a privilege, a stroke of good fortune and an honour. Her strength and courage left a mark on anyone she knew, and there are a lot of people with a big gap in their lives today that will be impossible to fill. God rest, Lena, thank you for being so encouraging, and I hope you're now out of pain and reaping the rewards for what you gave to others. It's been some time since I was able to put those two words together but I have enough news about the "not quite finished yet" Suffolk County Town to justify a full post. 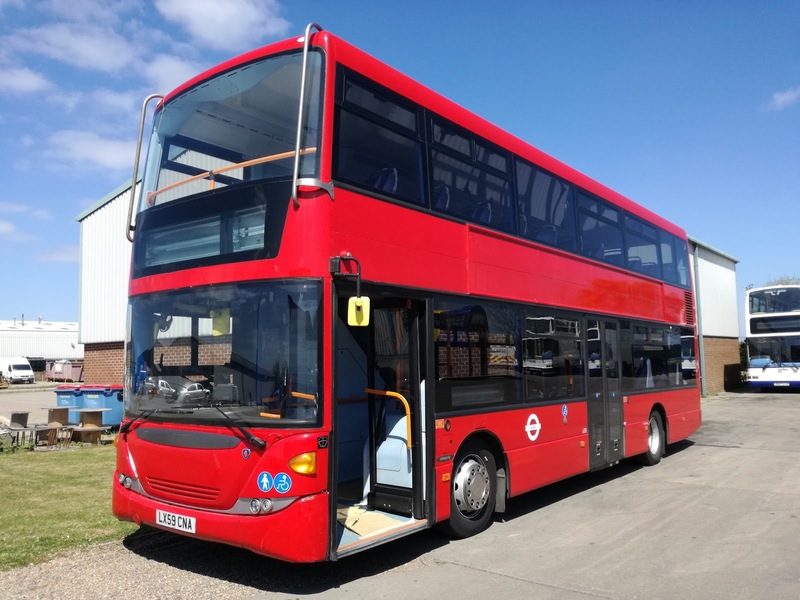 Top of the agenda is the arrival of the first E300 that will be operating the Ipswich P&R from July. 67776 SN62 AXU came down from Scotland yesterday. Formerly First Borders, which no longer exists, it is one of what will be eventually 8 vehicles, although I understand at present the 8th is proving a bit elusive. 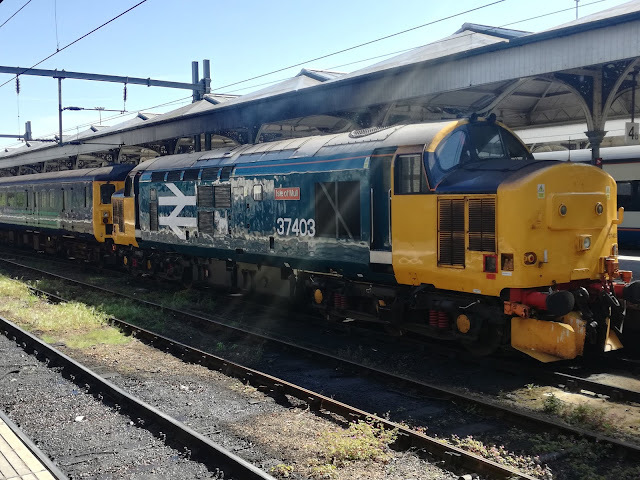 5 others have arrived at Yarmouth for preparation, and a couple will be used in Great Yarmouth for evaluation, although there is a debate if they will remain at Yarmouth or move to Ipswich in July. I can settle that debate as Chris Speed has confirmed to me that all will be going to Ipswich. For further details on the other vehicles see East Norfolk Bus Blog. Anyhow as luck would have it I had a business meeting with a well known German supermarket in Ipswich this afternoon so took the opportunity to pop into Ipswich depot and take a look at the E300. I've said this before and I'll say it again - I have never been in a friendlier depot operated by a national company. You cannot just pop in there as everyone is happy and willing to talk. It must be the best part of a year since I was there last yet it could have been yesterday. Great stuff. Just wish more happened there. So I was invited on the E300 to take a look. I confess I don't have much experience of E300's but the ones I have been on are in a different league to the E200's. They are certainly more spacious than the Versas they will replace. The general consensus seems to be thank God they're not Streetlites, and I have to agree. There was concern from opposition Councillors that First would put any old rubbish on the P&R but that has not proved to be the case. I look forward to sampling them once they are in service. Someone who had driven it said it was lovely to drive, which is important too. The E300's will have something new on them though - they are all being fitted with state of the art, GPS linked destination screens, which automatically change at terminii. I assume there is a driver override option but it's different, if a tad unnecessary for a P&R. However, it does mean that the current screens will be removed and will be put in 8 of the B7tl's that still have polka dot displays. That will be good. In the meantime 67776 is being de-vinyled and will go up to Simon Morris tomorrow to be painted into P&R colours, which not even the Engineering Manager knew the details of! Ipswich Town blue has been rumoured so we'll just have to wait and see. My thanks to Barry, Joe, and everyone else at Ipswich depot and I look forward to popping in more regularly over the coming weeks. The other main news concerning Ipswich, as yet unpublicised, is that Ipswich Buses' 38, the free circular shuttle bus serving Endeavour House and the Town Centre is to be scrapped from the end of June. As yet I don't know if anything is going to replace it, or other routes diverted to cover the Endeavour House section, but it is another indication that all may not be well between Ipswich Buses and the two Councils. As soon as I know anything else I'll of course let you know.